When the head of the NT Labor Party disappeared overnight to help Kurds fighting IS in Syria, it was big news. When he returned alive three months later, Australian Federal Police were waiting. What really happened on the front line? 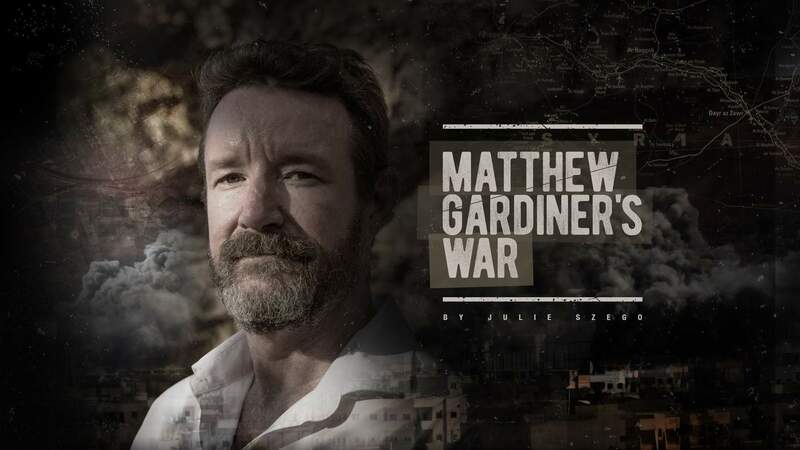 A year on, Matthew Gardiner breaks his silence. 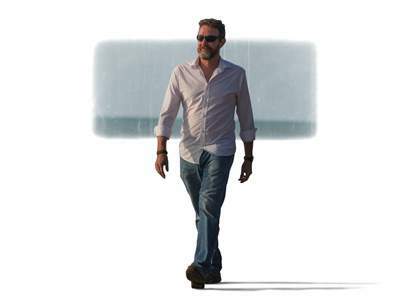 The day before his disappearance last January, Northern Territory union boss and state Labor Party president Matthew Gardiner told his Darwin colleagues and his family that he would be driving to Alice Springs early the next morning. It was a smart cover story. His union, United Voice, has an office in Alice Springs and Gardiner visited regularly to take care of business. 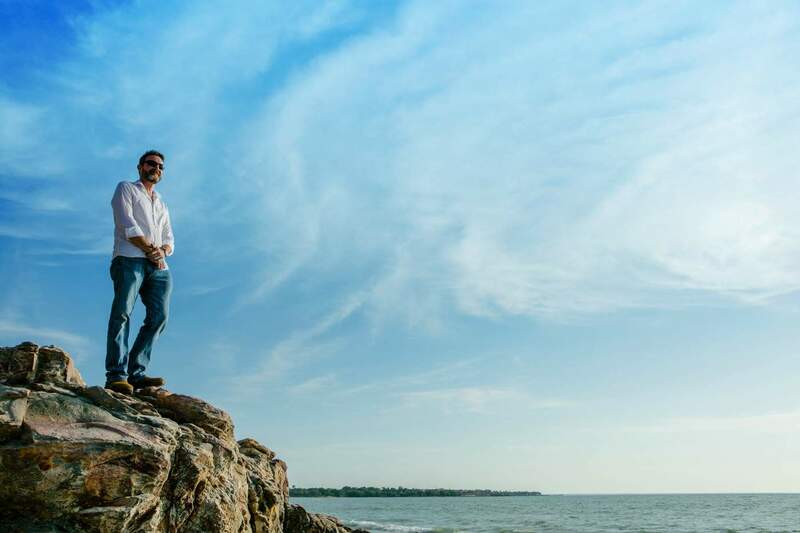 The days-long road trip from Darwin to Alice traverses areas without mobile coverage, so his elusiveness was unlikely to raise alarm bells, at least not immediately. At home, in the stifling humidity of the NT’s wet season, he packed a sports bag of winter clothes. He threw in a pocket medical textbook, a relic from his years spent working as a nurse, and about $US200 left over from a previous trip. He logged on to his Facebook page and deleted all his friends, except for his former Army mates – the only ones he trusted to hang up on the journalists who would inevitably trawl through his contacts. He posted a letter to the union’s national secretary, David O’Byrne, in which he resigned as head of the NT branch, and another to his own office staff. And he wrote to his wife, Andrea, and their three sons aged between 3 and 11. “I can’t sit back and watch this stuff happen,” he explained. He said he wasn’t sure when he’d be back, but that he would be back. He said he loved them. He assumed – wrongly, as it turned out – that the letters would arrive the following day. In the early hours of Thursday, January 15, he drove to Darwin International Airport. Weeks later, the media reported he lied on his departure form about his final destination. He insists this is false: he wrote “KRG”, short for Kurdistan Regional Government, the semi-autonomous region in Iraqi Kurdistan. The passport officials waved him through. He flew to Asia, stopped in Dubai, continued by air to Sulaymaniyah, a Kurdish city in northwestern Iraq. From there, squeezed into a Toyota ute, weaving through chaotic traffic and regular checkpoints, he travelled more than 400km west to the Syrian border. On the other side, commanders from the Kurdish militias known as the People’s Protection Units, or YPG, were expecting him. Gardiner had gone to help a people who, according to the adage, “have no friends but the mountains” in their fight against the atrocity of Islamic State (IS). “I haven’t exactly had a straight career path,” Gardiner grins, clutching a Cascade Light beer. It is Darwin Cup weekend in late July, about 18 months after he left for Syria, taking his career, and more besides, over a cliff. We’re in the outdoor section of a pub that’s spilling onto the footpath, the surrounding exuberance mounting to a din, though Gardiner seems oblivious to the noise. “Parliament House is just down there.” He gestures at the street behind him, reminiscing about the demonstrations he orchestrated outside those grounds during his seven years as secretary of the union representing hospitality, childcare and emergency services workers. At least he can freely share war stories of the political kind, even if he does redact the odd union scandal. As for the three months he spent in the al-Hasakah province in the north-eastern corner of civil war-torn Syria, that’s a riskier conversation. This is his first extensive one with a journalist since his return to Australia last April. “I prefer to talk in the pub,” he had told me weeks earlier on the phone, “it’s where I talk to my lawyer.” His reasoning involves lawyer-client privilege, draconian national security legislation and the Australian Federal Police – dots I won’t join here. 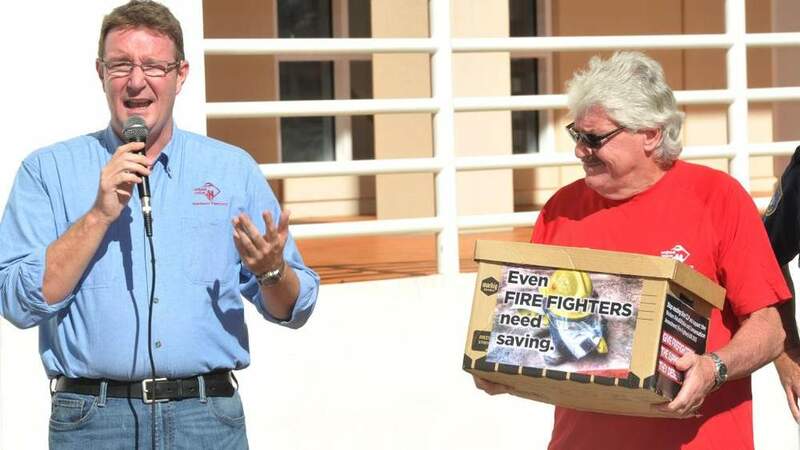 Union warrior: Matthew Gardiner [left] campaigns for firefighters in 2014 as NT Secretary of United Voice. Photo by Justin Sanson, NT News. Gardiner’s paranoia is utterly rational; his overseas adventures could land him in jail for life. That’s why he must watch his words and vet each of mine for anything that might inadvertently incriminate him. Australia’s foreign incursion laws, made tougher by the Abbott Government in December 2014, prohibit fighting in a foreign country unless it is with the armed forces of the country's government. The legislation makes no distinction between the jihadists who go to Syria and Iraq to fight with terrorists and people such as him who go there to help vanquish them. To make a case against Gardiner, the authorities must prove he was indeed fighting overseas and not, as the media reported in his absence – quoting anonymous Kurdish militia officials and an Iraqi border crossing official – engaged in “humanitarian work.” Only days before our meeting, the AFP told the NT News Gardiner was under “ongoing” investigation. Uncertainty swirls around him. A week earlier, Sydney journalist Renas Lelikan was charged with being a member of the explicitly banned Kurdistan Workers’ Party, or PKK, a sister organisation of the YPG (which is not banned). In February, the Attorney-General George Brandis discontinued the prosecution of Melbourne man Jamie Reece Williams, who aspired to join the YPG in Syria but was stopped at the airport. His rapid-fire jokes are interspersed with philosophical platitudes, such as “every day you’re alive is a good day.” Again, this perspective is profoundly rational. A week after our meeting, Gardiner attended the Perth funeral of YPG volunteer Jamie Bright, 44, shot dead in Syria in May. He first met Bright when both were young Army sappers at the School of Military Engineering at Steele Barracks in Moorebank, Sydney. Last year, in Syria, the men stumbled upon one another, again in uniform. “I know you!” Gardiner had said. About a year before his death, Bright lost his passport in Syria. He wanted to retrieve it from the combat zone, but according to Andrew, “Matthew said to him, ‘nah mate, you go back there, you die.’ So unofficially, Matthew saved Jamie’s life for 12 months”. When Queenslanders Reece Harding and Ashley Johnston were killed fighting with YPG militia last year, Gardiner contacted their grieving families, assuring them their sacrifice was not in vain. On his return to Australia, an ABC report noted Gardiner “looked healthy and appeared to have lost weight.” Dressed in a black t-shirt and jeans, he’s still fighting lean, despite all the time he’s spending in pubs. And though his eyes are watchful, he has the simmering intensity of someone all but bursting to tell his story. From adolescence, Gardiner was an avid reader. The only child of union delegate parents – his father a clerk, his mother an employee of the NSW State Lottery Office – Gardiner devoured the novels of John Steinbeck and Ernest Hemingway, notably For Whom the Bell Tolls, the latter’s classic portrait of the International Brigades fighting alongside the Republicans against Franco’s fascists during the Spanish Civil War. His years at the multicultural melting pot of Parramatta High, in Sydney’s west, taught him “how to swear in seven languages”, but otherwise failed to fire his imagination. Almost every male in his family having served in the military, Gardiner hankered for the Army. He tried to join, unsuccessfully, at 16. A year later, he got his wish. The army was home for the next decade. Gardiner obtained his Higher School Certificate, trained as a combat engineer and later as an engineering surveyor. One evening in early 1993, he saw on the news that Australia would send troops to civil war-torn Somalia as part of a US-led multilateral humanitarian force. Gardiner belonged to the 3rd Brigade overseas deployment force and knew immediately what would happen. Within 24 hours he was ordered back to Townsville; 28 days later his First Battalion Group was in the Somali capital Mogadishu, followed by Baidoa in the south – known as “the city of death”. His battalion’s role in Operation Solace included sweeping territory for land mines and unexploded ordinance, and building infrastructure. They extracted bombs from the wells, erected schools, court houses and jails – in the first jail they built, local leaders executed a bandit almost as soon as the cement had dried. One night, in a village near the town of Burhakaba, Gardiner and his section commander stumbled on an unoccupied hut. At 27, Gardiner felt restless again. He had met Andrea about two years earlier while stationed in Townsville; she was studying nursing at James Cook University. The pair was now itching for travel, so he resigned from the Army. His grand tour overseas saw him working as a hausmeister (caretaker) in a 400 year-old chalet near Innsbruck, a security guard in London’s Hayward Gallery, and a surveyor’s assistant on the construction of London’s Millennium Dome. “If you dive down to the bottom of the lake there, you’ll see my initials spray-painted on the concrete,” he grins. Returning to Australia, Gardiner figured his best option was to back his existing skills with formal qualifications and study surveying. He was accepted into Queensland University of Technology in Brisbane. But when, in the early 2000s, the bottom fell out of the construction industry, Gardiner switched courses midstream, enrolling in nursing. Andrea and his in-laws being in the profession, he knew what he was getting himself into. After the blokey culture of the army, the nurses’ “smoko room” was an education in celebrities and handbags. He thrived in the “unstructured chaos” of the emergency department and, being a military man, he was also primed to the challenges of the operating room where “everything’s controlled, but when something goes wrong, it goes spectacularly wrong”. As Andrea’s close family lived in Darwin, Gardiner shifted to an accelerated nursing course at Charles Darwin University. He got a job at Royal Darwin Hospital. True to his roots, he served as the union rep for graduate nurses, then for theatre nurses. When someone from the nurses’ union went on maternity leave, Gardiner got a job as an organiser. Evidently, he developed a reputation as a canny operator because 18 months later the state secretary of the Miscellaneous Workers’ Union – which changed its name to United Voice in 2011 – offered him a job as a lead organiser. Within a year, in 2007, he was “the first local secretary of the ‘missos’ in 10 to 15 years.” It was an adequate consolation prize for narrowly missing out on pre-selection for the Federal seat of Solomon the same year. [L-R] Gardiner as an Australian soldier, his patches, and at ease in the Army. At the moment when he felt the magnetic pull of an overseas battlefield, Gardiner was not only state ALP president, but also treasurer of the peak union body, Unions NT. He was regarded as a safe pair of hands. “I mean, they were too fat for jihad…” He shakes his head. As union boss, Gardiner always gathered intelligence on his employer opponents. He never embarked on an industrial fight without knowing everything there was to know about, say, the company manager who faced him across the boardroom table. How secure was this person within the company? What were their likes and dislikes? Who were they sleeping with? You can take the man out of the Army, but you can’t take the Army – and its warrior creed of ‘know thy enemy’ – out of the man. So having made his momentous decision, Gardiner once again gathered intelligence, frantically researching IS – he prefers the name “Daesh” because this denies the group legitimacy and avoids tarring ordinary Muslims with the terrorist brush – and the myriad actors in the Syrian civil war. His reading led him to the anarcho-socialist experiment in Kurdish-controlled Rojava, a verdant, roughly 400km stretch of northern Syria between the Tigris and Euphrates rivers. He learned how, in the instability wrought by the Arab Spring protests of 2011, some 2.2 million Kurds created a loosely-federated quasi-state encompassing a patchwork quilt of ethnic and religious minorities. He discovered the YPG militias, the de-facto military of Syrian Kurdistan who, alongside allied guerrillas, were beating back IS troops on the ground, even as next door a hostile Turkey frustrated their nationalist ambitions. He learned the militias had all-female combat units. With a new imperative of ‘know thy friend’, Gardiner read the Rojavan constitution, noting its entrenched commitment to gender equality and secular democracy in a region blighted by regressive politics. He came to see the Rojavan Kurds, and the dozens of Westerners fighting in their ranks, as almost the contemporary equivalent of the Spanish republicans and the International Brigades in their prescient war against fascism in the 1930s. On Facebook, Gardiner contacted a woman known as Kader Kadandir, whose name had been linked with the recruitment of Westerners to a YPG brigade known as the Lions of Rojava. Then, in homage to the journeys of his literary hero Hemingway, he booked his ticket. Departure date: 15 January 2015. Later that month, when the news broke of Gardiner’s flight to Syria – he says his family never spoke to the media – Kadandir wrote on Facebook that she had not known he was a “political man”. “But I have shock now,” she added. A man from Perth admonished her: “He was a normal family man. You appear to have helped change that. Shame on you.” One former union colleague expressed admiration for Gardiner, describing him as a passionate “but also level-headed” bloke. Labor leader Bill Shorten said he did not know what triggered Gardiner’s actions, “but he needs to come home”. In a move that still stings Gardiner, the party, citing the “serious reports,” immediately stood him down as NT president and suspended his membership. Some party members speculated he was angry about missing out on pre-selection for Solomon. In al-Hasakah province, the YPG commanders bunched the Western volunteers together. When Gardiner arrived, there were around 15 all up. He soon clustered with four others – two Americans, a British national and a Frenchman – to form a core inner group of senior ex-military, with combined experience from the French Foreign Legion, French Marines, and the US Army and Marines. It had taken Gardiner little time to figure out that survival depended not just on dodging the bullets of the IS snipers taking cover in churches, schools and hospitals, but also on steering clear of Dutton’s “cowboy” Westerners. Americans, for instance, still pumped with adrenaline from the Iraq campaign and alarmingly ignorant of this yet more complicated war zone. Although, Gardiner laughs, even the more sophisticated Americans found the ideological milieu as confronting as the flat bread with salted goats cheese passed around for dinner. Some were genuinely shocked to discover their Kurdish brothers-in-arms, while avowed secularists, were culturally Muslim, and more rattled still when they learned of the YPG’s Marxist politics. [L-R] A pro-YPG poster, Matthew Gardiner with the Rojava flag, and the late Australian YPG volunteer Jamie Bright, who was shot dead in May 2016. “The Americans were like, ‘what, you’re caarmunists?’” Gardiner says, mimicking a southern drawl. “We had some fierce political arguments,” Gardiner says. Whatever their ideological inclinations, the Westerners looked on with awe – and occasional bemusement – at the Kurds’ commitment to military democracy. After a soldier fell asleep during guard duty, a meeting of his peers was called to decide on his punishment. On another occasion, during a visit to an Assyrian church that had been targeted by IS, Gardiner, in a casual gesture, left a cash donation. He was immediately reprimanded by his Kurdish comrades, who explained the YPG must be above any charge of religious or sectarian bias. But it was also true, he explains, that the key to safely navigating the cantons and ethnic enclaves of a newly disintegrated Syria is understanding the “war of the flags”. Drive into an area controlled by a particular militia and you had better ensure the right flag flaps at the bonnet. When the work was done, the pair vowed, each would visit the other’s home town. As the temperature fell below zero, everyone slept huddled together “in the middle of nowhere, in the open, on the ground”. On one bitterly cold night, Gardiner “snuggled up to this little Kurdish guy,” taking turns at spooning on one side, then the other. At one point during his time in Syria, Gardiner reached an internet cafe. Holding his breath, he googled himself, saw the number of results and immediately went off-radar. “You know you’ve made it when you’re on CNN,” he deadpans. “The downside is you have a bounty on your head, and for ISIS it’s higher for Westerners.” Some of the Kurdish fighters told him the publicity had inflated his value tenfold: whereas IS paid $US20,000 for a standard kidnapped Westerner, for him they were willing to fork out $US200,000. “So you ask if I made an impact over there.” Gardiner is reaching for his phone again. He calls up a Wikipedia reference about the Eastern al-Hasaka offensive with colour-coded before-and-after maps, indicating the territory that changed hands. For a period of three weeks and three days between 21 February and 17 March last year – as the speculation about his absence swirled in Australia – Kurdish and allied militia liberated the major towns of Tal Hamis and Tel Brak from IS control. Coming only months after the Kurds’ stunning recapture of the Syrian-Turkish border town of Kobanî, the offensive was an important strategic victory because it disrupted the north-eastern corridor that had connected the IS de facto capital in Raqqa with its stronghold of Mosul across the border in Iraq. In a fierce counter-offensive, IS kidnapped more than 200 Assyrian-Christian civilians from around Tel Tamir. When Gardiner speaks of the battles, it is conspicuously in second person, “when you see this”, “when you do this”. But each sentence comes out faster than the last, and the colour rises in his cheeks. Towns reclaimed from IS had a post-apocalyptic feel. Etched in his memory is the sight of the women reaching the checkpoints in liberated areas and immediately ripping off their face veils. One day in February, as the offensive raged, a Kurdish fighter informed Gardiner, “your friend got killed”. He was referring to Queenslander Ashley Johnston, another volunteer with YPG and reportedly the first Westerner to die in battle against IS. Gardiner had met him a couple of times. Knowing that news of Johnston’s death would break in Australia, he sent a text message to Andrea. Gardiner says he texted her once a week, each time from a different mobile phone so his location could not be traced. But nor could she reply to him. “I’m safe and well,” he told her. Also on the theme of self-sacrifice for the greater good, I asked whether he followed YPG procedure in always carrying one extra bullet – to ensure he’d never be captured alive. A contingency plan is one thing, a suicide mission is something else entirely, and in April he feared he might have signed on to the latter. There were critical differences in strategy between YPG’s Kurdish commanders and the more professionally trained Westerners. He understands these differences have since been resolved, but the commanders weren’t making decisions fast enough, so Gardiner and several other western volunteers decided to bail. Approaching the Iraqi border, they made sure the flag on their car matched the flag at the checkpoint. And they slipped out of Syria. The passport control officer in Stockholm, bleary-eyed at around 3am, looked at Gardiner’s passport, looked at her screen, looked back at his passport, then back at him. In Singapore he ran into an ABC radio reporter he knew – clinching the broadcaster an exclusive on his return home. “And in Darwin at customs and quarantine I stood in the ‘Something to Declare’ aisle – because, well, I had something to declare,” he grins, turning his palms up theatrically. “I had been to a farm in the past month, I had four packs of tobacco rollies. In the airport interrogation room, the AFP officers produced the list of mobile phone numbers he used to send messages to Andrea. They took swabs from his hands. He watched as they tested all his belongings for gunshot and explosives residue and photographed each one. They confiscated his electronic equipment and his Kurdish phrasebook. They picked years-old spear grass from his Explorer socks. The interrogation lasted eight-and-a-half hours. Gardiner exercised his right to silence. As for the tone of those conversations, Gardiner says “she was more relieved than anything else”. Yet clearly there was a bit of “else”, because he learnt “the bastards at Australia Post” took two days to deliver his farewell letter to his family. For two anguished days Andrea imagined he had been in a car accident en-route to Alice Springs and was dying in the outback. She imagined all sorts of things. The day after Gardiner came home, journalists arrived on his doorstep. He asked them not to reveal his address – after all, he’s on the IS hit list – but otherwise said little. Three weeks later, after two television current affairs programs aired segments on Kurdish female fighters, he tweeted vague but tantalising references to his time in Syria. Then, in May 2015, about a month after his return, his friend, Seran, the geneticist, was “martyred” in battle. He posted a Facebook tribute with her photo – a young woman in khaki, her hair tied back, her unsmiling gaze trained directly at the camera. Her image framed against the background of the YPG flag with the red star. Thereafter, Gardiner began memorialising other fallen comrades, Kurdish and Western, his Facebook feed a lonely vigil for casualties in a war at once both urgent and remote. 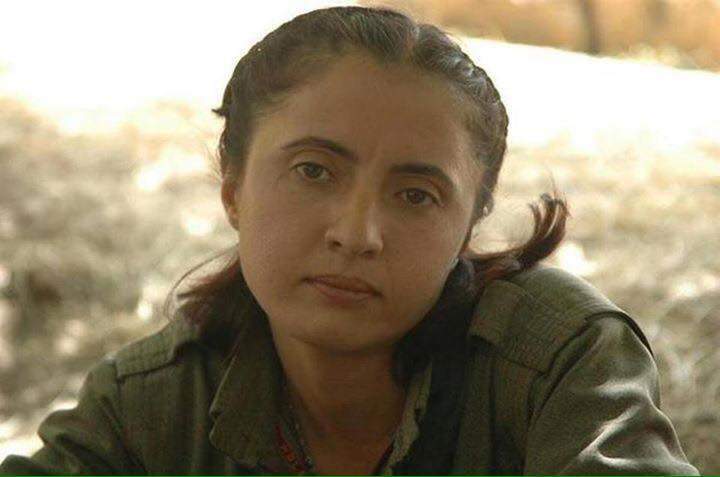 Kurdish fighter and geneticist Seran Altunkilic, who spoke English and became Matthew Gardiner's best friend, died in battle in May 2015. Meanwhile a fan club of strange bedfellows was lionising him. As a military man in the left, Gardiner is accustomed to feeling like a political orphan: leftists are suspicious of his army background, the right suspicious of his union activism. But irony takes on an entirely new meaning when the late Labor icon Bob Ellis writes a poem about you (“he’s a legend”) at the same time as conservative columnist Miranda Devine advocates your cause. (“I felt unclean,” smirks Gardiner.) And being scrupulous about his homework, he almost certainly read a column of mine in The Age, published four days after his return, criticising the conspicuous absence of “comradely support” for Gardiner on the left. When he speaks about his ostracism from the Labor Party, his hurt is palpable. He applied to just about every health sector employer in the state – remote services, private hospitals. The answer was always the same. Nothing to be done, says Gardiner. Union activism coupled with overseas adventurism makes him a tough sell. But he’s excited about the opportunities in law. Recently, he interned with a firm involved in high-profile human rights litigation against the Immigration Department for the mistreatment of asylum seekers in offshore detention. He runs me through a creative legal argument that uses occupational health and safety laws to claim the Government owes the detainees a duty of care – “I helped come up with this,” Gardiner explains, with dogged conviction and intoxicating optimism. In the meantime he supports himself with two part-time jobs: as a consultant for the NT’s Council of Government School Organisations, a not-for-profit advocacy group for public schools, and as a manager at Woolworths. “The worst thing about Woolies is that I had to join the SDA,” he says, with signature wry grin, referring to the right-wing Shop, Distributive & Allied Employees Association. Not hard to see why the Kurds’ internecine war of flags – which Gardiner predicts will explode once the common enemy, IS, is defeated – was never going to faze a veteran of Australia’s factionally-riven union movement. A few months ago, he and Andrea separated “amicably” after 20 years of marriage. He now lives in student accommodation. Was the break-up a consequence of his fateful decision? The following night on Darwin Cup weekend, in another Asian restaurant, Gardiner has been in full flight for a couple of hours, “level-headed” and “passionate” as his union colleague observed. The situation in Syria is “complex”. Western boots on the ground are not necessarily the answer. But why no outrage about weapons and fighters passing to IS across the border of Turkey, a NATO country? The YPG being accused of ethnic cleansing and other human rights violations? Well, there are two sides to that story. But his tone is always gentle. The lesson, he concludes, is that ultimately “progressives always win”. Look at the struggle for women’s enfranchisement, workers’ rights, Aboriginal land rights. At the back of the restaurant a waitress begins stacking chairs on tables. We’re the last patrons here. Julie Szego is an author and freelance journalist. 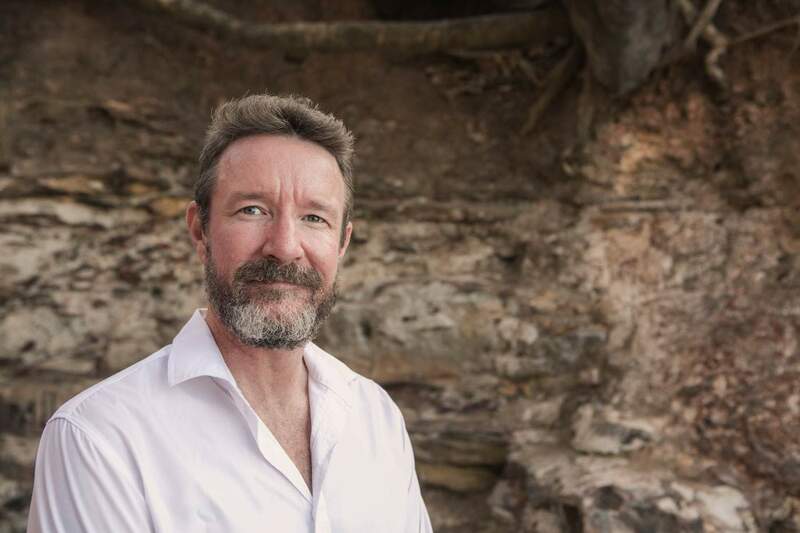 Photos of Matthew Gardiner by Territory Rig Media.